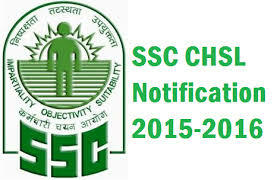 Eligibility Criteria of SSC CHSL 2016? Age Limit ? Minimum age is 18 years and maximum age is 27 years as on 1 August 2016. Age relaxation provided to certain categories as per the government rules. Educational Qualification ? Candidates must have passed 12th Standard or equivalent examination from a recognized Board or University. Application Form of?SSC CHSL 2016? Interested and eligible candidates can visit the official website of SSC ssc.online.nic.in to apply for SSC CHSL 2016 Exam. Application Fee / Mode of Payment? Online Application ? Candidates have to pay fee of Rs. 100, candidates can pay application fee through challan at any SBI branch, net banking and any credit/debit cards. (SC/ ST/ Female / PH category aspirants no need to pay any fee). Offline Application ? Candidates have to pay a fee of Rs. 100 as application fee through CRF stamps which can be bought from the post office. Fee is exempted for all female candidates and reservation category as per the rule of Government of India. Written Examination of 200 Marks? (Objective Type)? Marks score in written examination. According to the date of birth, who is senior in the age. Alphabetical order in which first names of the candidates appear. Exam Pattern & Syllabus SSC CHSL 2016? (4) General Awareness /?General Knowledge. Exam will have 200 questions for 200 marks. Questions will be set both in English & Hindi for?sections ? 1, 3 & 4.